Really interesting story titled "Barack Obama: Papa in Chief" from the latest issue of Esquire. Written by Tom Junod, it relates Obama's first year in office to the parenting movement/book series Positive Discipline. From the PD website, the first two concepts (among others) of Positive Disciple are "Mutual respect" and "Identifying the belief behind the behavior". This in mind, the main point that Junod makes is that Obama's style of governing is both the same measured and thought-out approach that he showed while campaigning and is very much in line with the principles of Positive Discipline. As defined by myself, these include "take the time to teach", "understand the viewpoint of others" and "don't act impulsively". While it's true that more aggressive techniques of parenting or governing may get more immediately tangible results, the long haul outcome should (hopefully) be all the better for this long term approach. Also from this Jan 2010 issue of Esquire was the short piece "How to Start a Small Business" by Ken Kurson. Truthfully there wasn't a huge amount of instruction (as one of the three directives was to purchase QuickBooks), but the article certainly made appealing the idea of owning at least a piece of a small business. Finally, it wasn't from this particular issue, but given that these are all Esquire works, I wanted to link to "Garret Dillahunt: The Man Who Disappears" by MFLW (my favorite living writer) Chris Jones. I've posted on lots of his stuff here (with his story "The Things That Carried Him" being my favorite) and I suppose just as Jones writes of a sort of man-crush on Dillahunt's movie and TV work, I have the same thing for his writing. Very very short piece and interesting. Finished reading "Ford County" by John Grisham and found it to be a fairly enjoyable book. It's the author's first collection of short stories following on the heels of his one non-fiction and scores of fiction bestsellers. Said catalog of Grisham books is detailed on his website and for myself "Ford County" as a read ranked somewhere above "The Street Lawyer" (which I didn't like at all) and below "The Innocent Man" (which was the non-fiction effort and I found to be excellent). I can't say that I learned anything from "Ford County" or that the writing was particularly enthralling, but... I was entertained and if someone generally enjoys Grisham, this book would not disappoint. From the last few BusinessWeek issues there's been some interesting pieces around the related topics of the economy and housing. From the Dec 28 issue came "Smile. The Economy Isn't in a Second Depression" by Peter Coy. Interesting piece that details how things could have been much worse. The same Dec 28 issue had "Home Prices Face Test Without Fed Support" about how in the Spring the Federal Government will start phasing out current tax credits for people buying homes. The Jan 18 issue had "Finding a Better Lifeline for Homeowners" about the idea of lenders cutting principal amounts due to help keep people in their homes and making payments. Couldn't find the article to link to, but also from BusinessWeek was mention of how ING offers a simple and transparent home mortgage program for potential borrowers. The December 28 issue of Sports Illustrated was one of those magazine issues that works on multiple levels... had great content and a lot of it. A couple of weeks ago I did two different posts with content from this issue. The first was "Wish of a Lifetime Piece from Sports Illustrated" and second "Sports Illustrated Picks for Best Writing of the Decade". Linked to was inspiring and excellent writing respectively, but which also left me with a piece from the very solid writer Joe Posnanski to post on. Really interesting story that fits perfectly in the category of "Where are they now?" 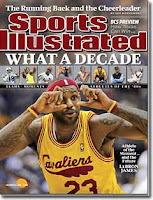 Also from Sports Illustrated (the week prior Dec 21 issue) came the cover story section "5th Annual: The Year In Sports Media". 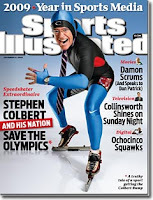 Starting off with the interesting story of Stephen Colbert promoting the U.S. Speedskating Team, this linked piece also included mention of the (entertaining sounding) HBO show Eastbound and Down and (having watched it... entertaining) Versus show Sports Jobs with Junior Seau (posted about here). Additionally of interest from this Sports Media section was this story on "The Art of Basketball" from ESPN writer Bill Simmons and the Digital Media page which featured mention of the iPhone apps MLB At Bat 2009 and FIFA Soccer 10. After publishing posts last month with my favorite articles from Esquire & Sports Illustrated and then great BusinessWeek and Fast Company features on Bottled Water & BPA I wanted to look next at some of the best stuff I've seen from Time Magazine. Looking at my favorite Time pieces, I found several were around two related topics... politics and the economy. From 2008 came two pieces by the excellent writer David Von Drehle. The first was "The Five Faces of Barack Obama" chronicling multiple views of how the then-candidate was seen and second "The Limits of Race". This story had a subtitle of "For White Working Class, Obama Rises on Empty Wallets" and looked at voters in the key swing state of Missouri and how the economy was influencing their Presidential choice. The August 2009 issue of Time contained "Inside Bush and Cheney's Final Days" by Massimo Calabresi and Michael Weisskopt. The story was about the VP's attempts to get a Presidential pardon for Scooter Libby and gives a good portrait of Bush and Cheney individually as well as the relationship between the two men. From an October 2008 issue, historian Niall Ferguson did a cover story titled "The End of Prosperity" and then in 2009 there were two pieces from Kurt Andersen (who wrote the bestselling historical novel "Heyday"). The first from Andersen was "The End of Excess: Is This Crisis Good for America?" (which was turned into a book) and second five months later was "The Avenging Amateur". Both featured really interesting writing and a definite optimism for the future. Great pieces all about these two topics. Interesting (and disconcerting) cover story from the latest issue of Time Magazine. Titled "What We Can Learn from Flight 253", it examines the attempted detonation of a bomb on a Northwest Airlines flight into Detroit on Christmas Day. As the piece by Michael Duffy and Mark Thompson reveals, would be bomber Umar Farouk Abdulmutallab came very close to his goal of blowing up the plane... which raises a host of questions about both how that occured and also what our response was. Abdulmutallab used a similar explosive to what hopeful shoebomber Richard Reid used, only rather than in his shoe, it was sewed into his underwear. While it's true that there are some next-generation airport screening devices that would have detected the bomb-making gear, the standard metal detectors at most US airports wouldn't have spotted it. Additionally, Abdulmutallab was on a US terrorist watchlist (but, only the first level which doesn't mean much). Profiling is another way that authorities can try to help prevent terrorism, and in their book "Superfreakonomics", (which I reviewed here) Steven Levitt and Stephen Dubner tell an anecdote about how effective it can be. However, profiling as well as full-body scanning machines at airports raise legitimate privacy concerns and can't be counted on to prevent bad things from ever occurring. On the same subject of preventative measures, there's the concern of simply taking after the fact actions that don't help going forward. From his book "The Black Swan: The Impact of the Highly Improbable", Nassim Nicholas Taleb wrote about this idea... with a potential example being everyone taking their shoes off going through airport security. Another thing to keep in mind is the recent example of Fort Hood shooter Nidal Hasan. As Nancy Gibbs detailed in her Time cover story (which I wrote about here), terrorism doesn't necessarily have to be sponsored, paid for and planned by a terrorist organization, but rather can be the act of a person or persons wanting to commit a terrorist act. All this considered, and as Duffy and Thompson argue in their cover story, you can't guarantee as a government that terrorism will always be prevented, so as prevention is practiced, you also have to look at response. To this end, the Duffy and Thompson piece quoted Homeland Security Director Janet Napolitano playing down the attempt by saying "once the incident occurred, the system worked" and spoke not of terrorism, but "man caused disasters." Also, "The Lesson: Passengers Are Not Helpless" by Amanda Ripley in this same issue of Time addresses both passenger response on Flight 253 and then how the FBI treated people after the attempted bombing was thwarted by the same passengers. The whole things is a big nut and tough to easily solve, but after reading the pieces both both Ripley and Duffy/Thompson (as well as past stuff), I think our government can do a better job of it's preventative measures, but perhaps even more importantly... of communicating with us as adults who understand we live in a dangerous world in which bad things can happen.